Aqua and cream colour in colour col. wax! Following on from their ?Hermit Kuppling? single and B-side, ?The Engine? - Holy Roar are pleased to unveil Modern Ritual?s highly anticipated debut album, ?The Light That Leaks In?. 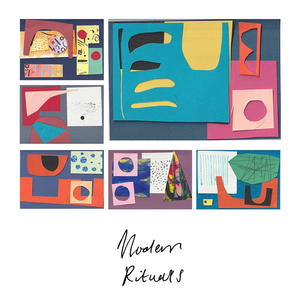 Modern Rituals are the rejuvenation that the UK?s Alternative Rock scene has been desperately crying out for, ?The Light That?? contains; anthemic tendencies, honest lyrics being screamed in a Pixie-esque tone and at points almost dreamy lead guitar lines that will have listeners humming the melody after just one listen. Don?t get this band wrong, when we say ?Alt -Rock? we mean the blisteringly heavy side of the genre with elements of sludge, much like their Boston based counterparts ?Pile?. This album will fill the hole in your heart that you didn?t know you had. Having supported Nothing, Mothers and USA Nails off the back of just a couple of EPs, you can be assured that this stunning debut will take them to the great heights of the British Alternative Rock scene and beyond!